You. Stop what you're doing. Immediately run to the grocery store. Well, run to the grocery store after you finish reading this blog post. 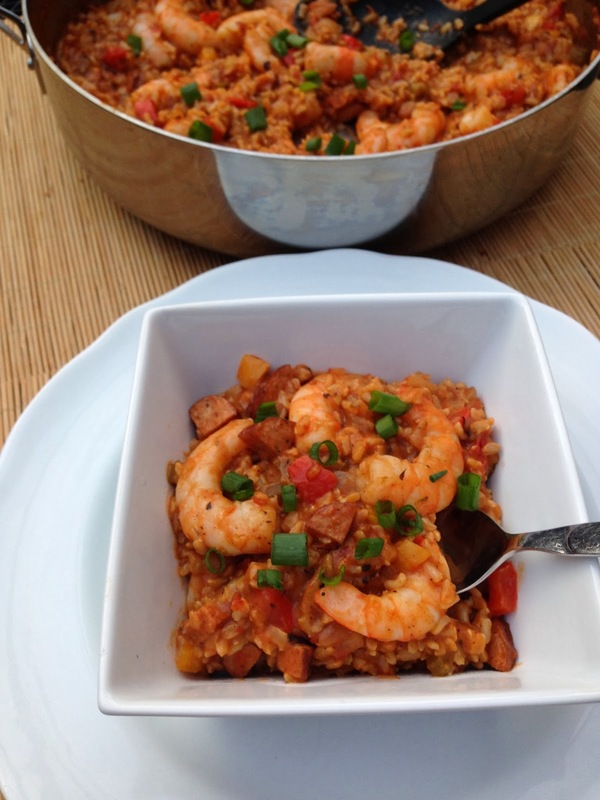 Buy what you need to make this jambalaya. Then make it. Then be the happiest person on earth. 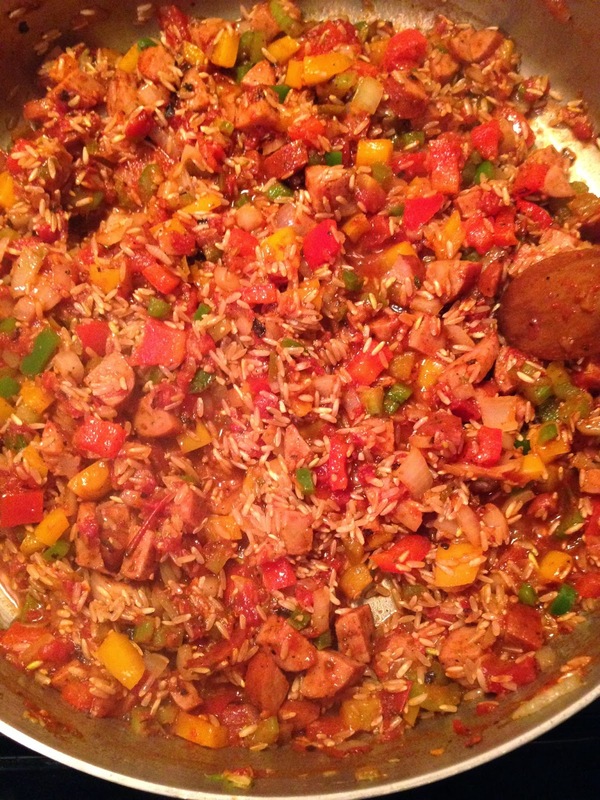 In all seriousness, this jambalaya honestly brought a moment (well, several moments) of true, everything-else-disappears happiness to my life. Okay, fine, we all know I'm a little obsessed with food, so maybe eeevvveryone wouldn't have a life-changing reaction to a bowl of dinner, but for me.... I was in pure ecstasy. This jamabalya ROCKS. 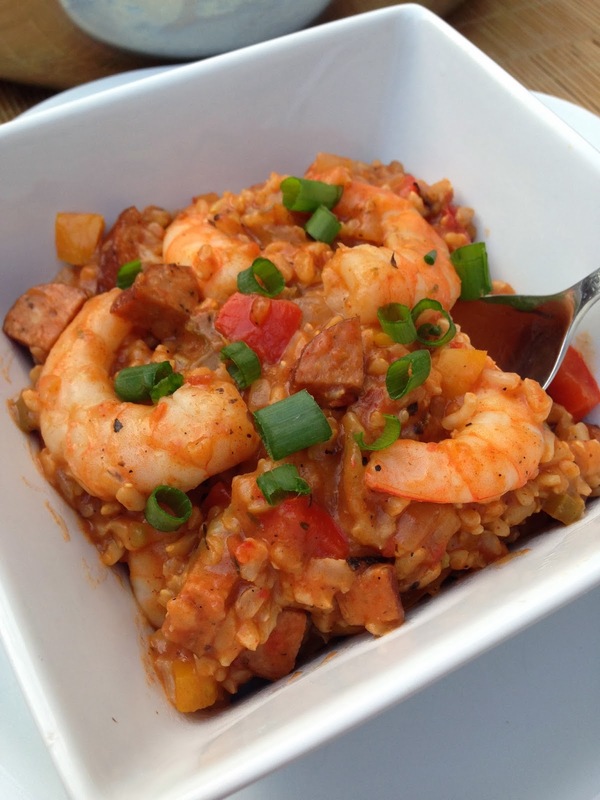 You might think jambalaya sounds like it would be hard to make, but it's really not! Yes, you have to chop a bunch of veggies, but that's the hardest part. And if you're anything like me, chopping veggies is a bit of therapeutic relaxation in an otherwise hectic lifestyle, right? So, besides your knife workout, this dish is pretty much as easy as tossing a bunch of things into a big pot -- yes, this is a one-pot meal! -- and walking away for a little less than an hour. So simple. So simple, but so unexpectedly delicious. 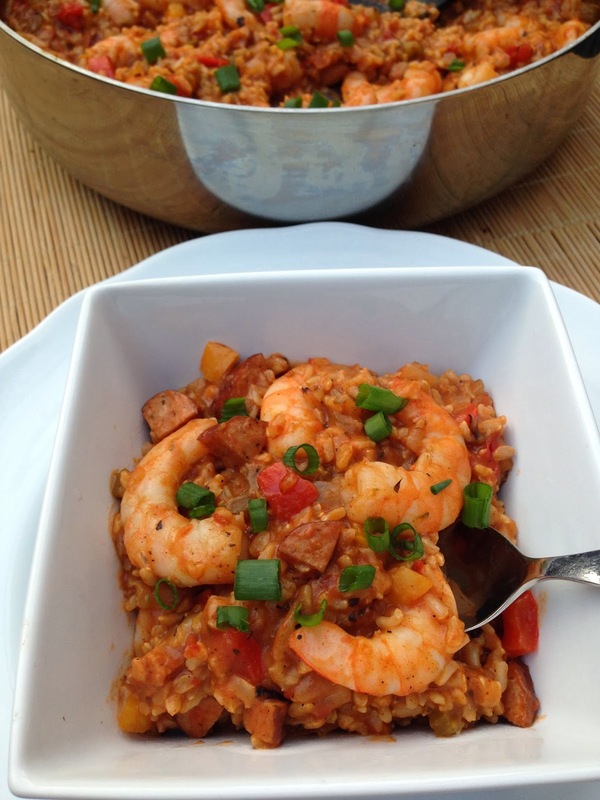 This is a totally and completely healthy, fiber and protein-rich meal -- it's made with brown rice, chicken sausage, shrimp, and plenty of veggies -- then you just just add your spices and somehow, some way, it becomes this pot of creamy, decadent, hearty, sweet, yet spicy, yet smoky, jambalaya. It's one of those meals that you can't even believe you cooked up yourself... it tastes better than restaurant quality! 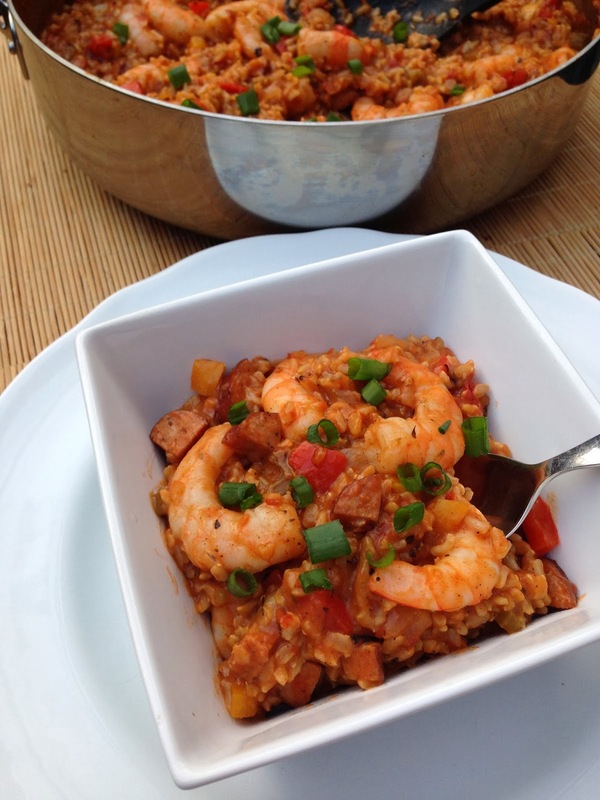 And I THINK (I can't promise; I'm no cajun expert) that this tastes pretty authentic, and IS pretty authentic, to traditional New Orleans-style cajun jambalaya. 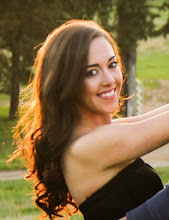 Just lightened up a bit. But you will not miss the butter or the white rice, I promise. Make it for yourself, make it for someone you love, make it for a crowd... it's pretty much guaranteed to be enjoyed by all. Gather your main ingredients. 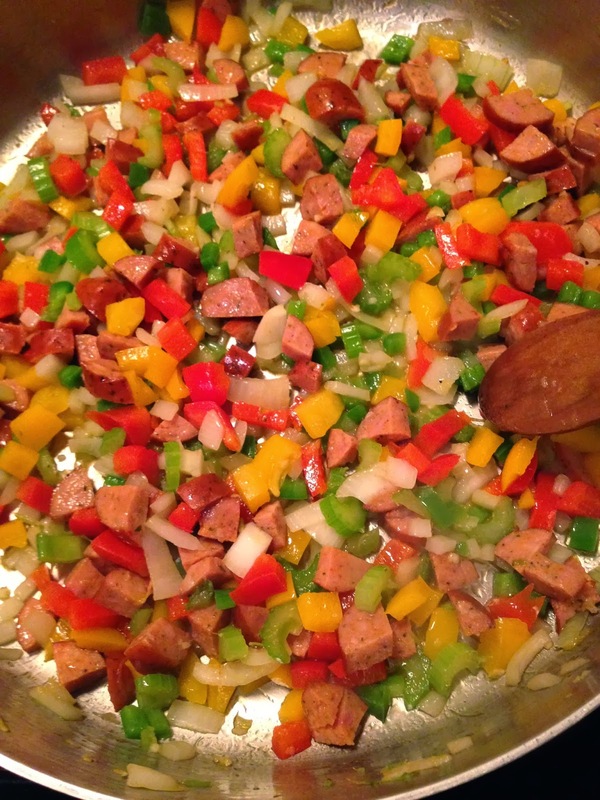 You need 6 ounces of andouille or cajun-style chicken sausage, a pound of fresh shrimp, two bell peppers, an onion, a jalapeno, celery, garlic, a can of fire-roasted tomatoes, worcestershire sauce, chicken broth, and 2 and a quarter cups of brown rice. Plus your spices. Here comes the hardest part: chop those veggies. Heat 2 tablespoons of EVOO in a large, deep saucepan or a dutch oven. 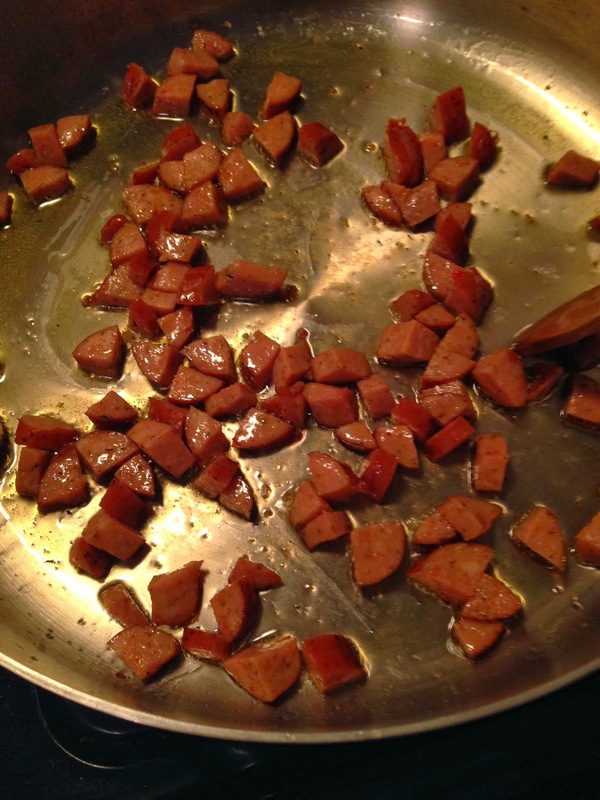 Add your chicken sausage that you've diced into quartered slices. Cook until slightly browned, about 4 minutes. 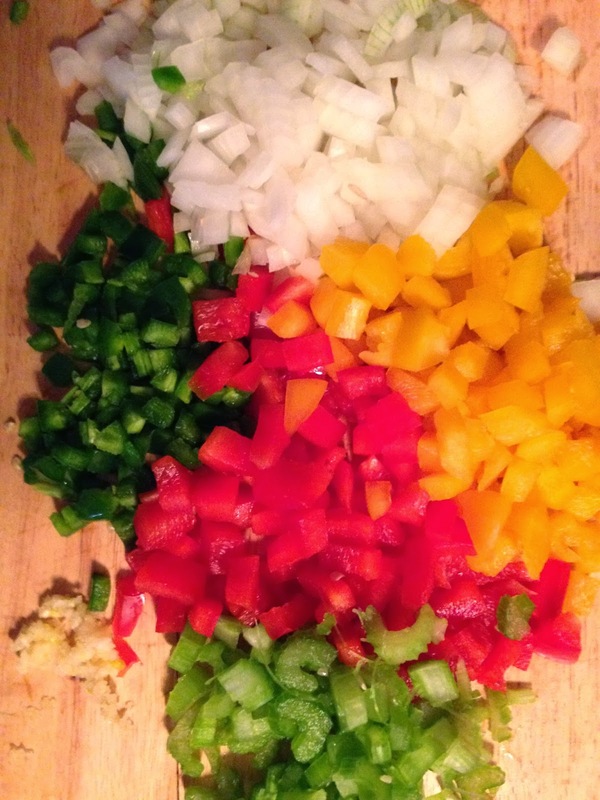 Add your chopped veggies: the bell peppers, celery, jalapeño, onion, and garlic. Cook until the veggies are just starting to get tender, about 4-5 minutes. Pour in your can of fire-roasted tomatoes. Add 1 tbsp worcestershire. Also toss in your spices: 1 tbsp paprika, 1/2 tsp thyme, 1 tsp cumin, 1 tsp oregano, and 1/8 tsp cayenne. Cook until it begins to simmer. Then, add in your rice. Stir it around for about a minute. Add your chicken stock. Bring to a boil. 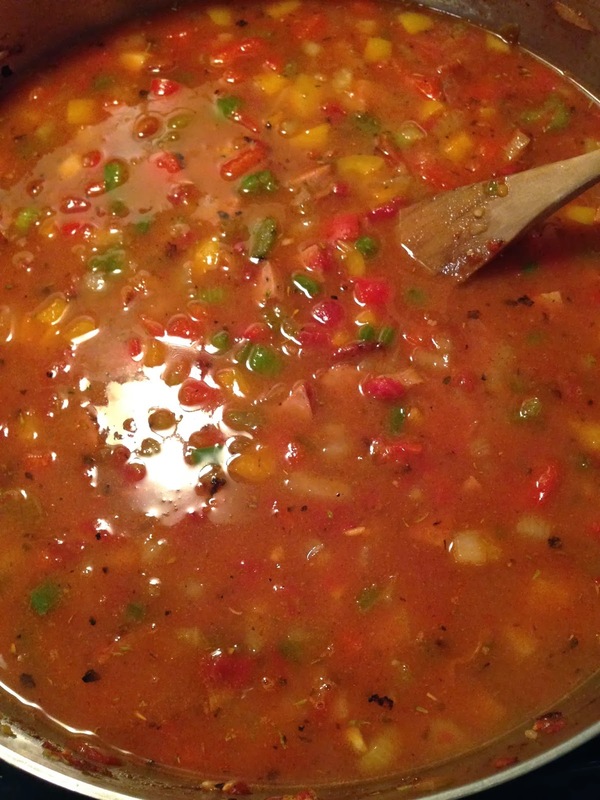 Then, reduce heat, cover, and let simmer for 50-60 minutes. Meanwhile, prepare those shrimpies. De-shell them all, and de-vein if needed. 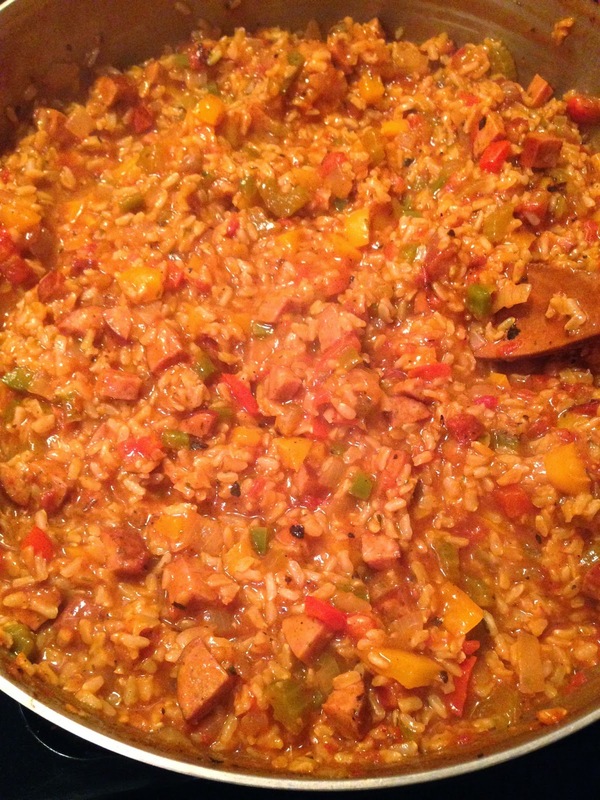 The jambalaya is ready when most of the liquid has been absorbed and the rice is tender. At this point, taste it. Add salt and pepper to taste. Toss in a bit more cayenne if you're into that. 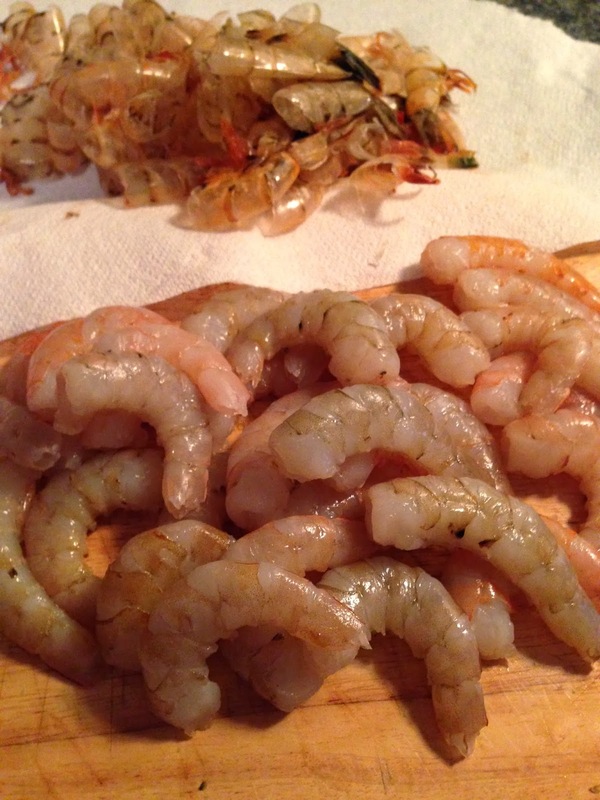 Then, toss in the shrimp. Stir around gently until the shrimp are fully cooked (i.e., pink and just opaque), about 5 minutes. It's reeeaaadyyy!! Pour in a bowl and top with sliced green onions if you'd like. Maybe some hot sauce if it's not already spicy enough for ya! *I used half of each bell pepper. You may want to use the whole thing if you really like peppers. -Heat the olive oil in a large, deep saucepan or a dutch oven over medium heat until hot. Add the sausage. Cook until lightly browned, about 4 minutes. 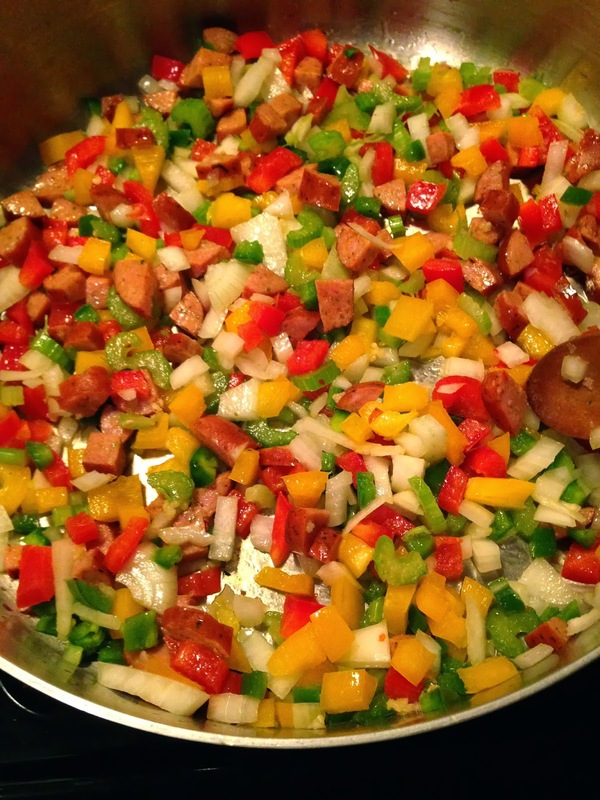 -Add the diced bell peppers, jalapeño, onion, celery, and garlic. 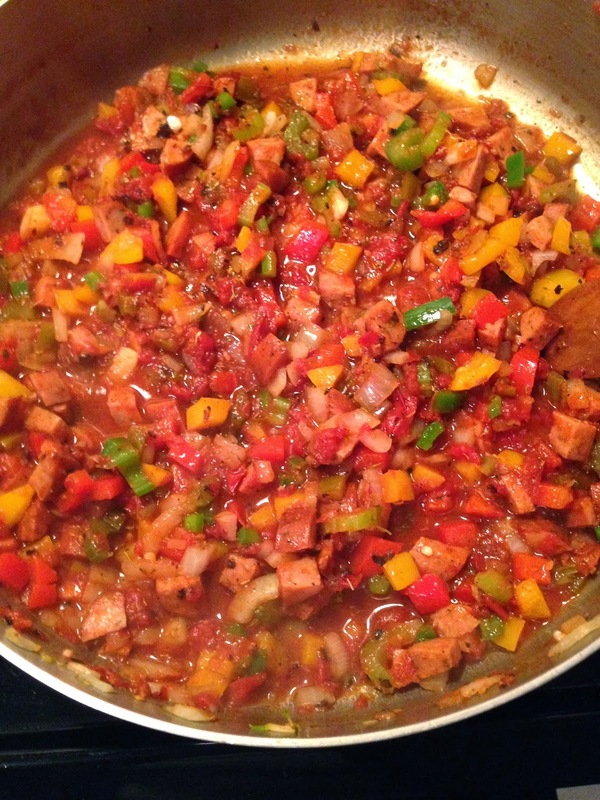 Stir and cook until the veggies are becoming soft, about 4-5 minutes. 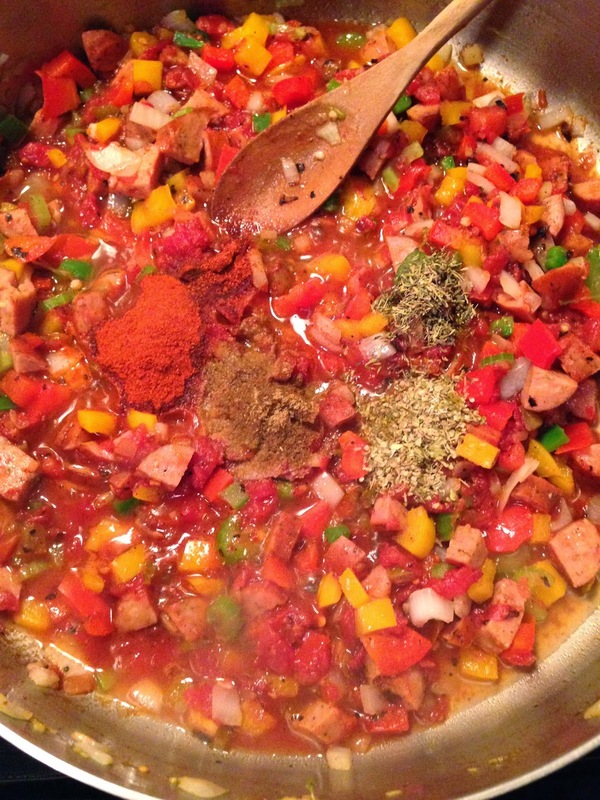 -Add the can of fire-roasted tomatoes, the worcestershire, and the paprika, thyme, oregano, cumin, and cayenne. Cook for a couple of minutes, until it begins to simmer. -Add your rice. Stir around for about 1 minute. Then, pour in the chicken stock. Bring to a boil. Then, reduce heat, cover with a tight-fitting lid, and let simmer for 50-60 minutes, or until most of the liquid is absorbed and the rice is tender. -Add salt and pepper to taste. Add another pinch of cayenne if it's not spicy enough. 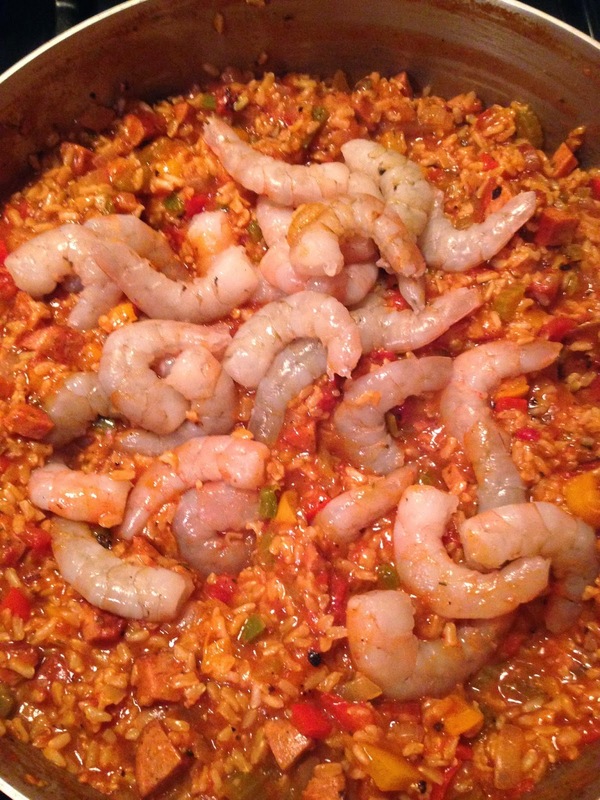 -Add your shrimp. 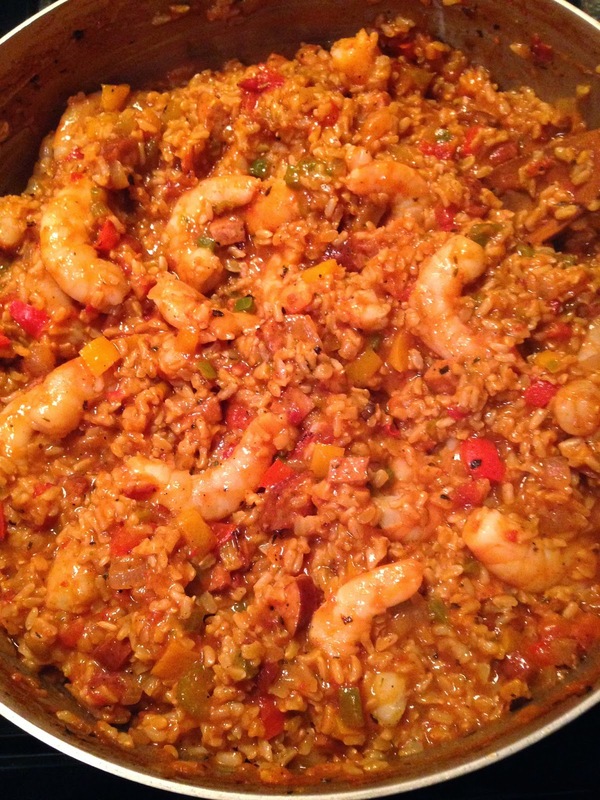 Cook, stirring gently, until the shrimp are pink and just-opaque, about 5 minutes. -Serve. Top with chopped green onions for garnish if desired. so glad you enjoyed it, Laura :) I'm liking your idea to do the prep in advance!